Zirconia ceramics are widely used, particularly for orthopedic applications such as femoral heads for hip prostheses. Recently the failure of a number of zirconia heads drawn the attention to the phenomena limiting the lifetime of zirconia ceramic pieces, in particular on the aging of zirconia. At room temperature, zirconia is retained in a metastable tetragonal phase by the addition of stabilizing agents (e.g. yttria); the aging of zirconia consists in a return towards the more stable monoclinic phase. The transformation is martensitic in nature and occurs preferentially at the surface of tetragonal zirconia ceramics. It has been shown that the tetragonal to monoclinic (t–m) transformation at the surface of zirconia ceramics is promoted by the presence of water molecules in the environment. Being subject to a volume increase, this t–m transformation induces the formation of microcracks at the surface, and an increase of the roughness. Microcracking leads to a decrease of the mechanical properties. The aging should then be avoided, or at least kinetics taken into account to calculate the lifetime of zirconia pieces. applying the martensitic model to understand and predict the transformation of zirconia. Deville S, El Attaoui H, Chevalier J. Atomic force microscopy of transformation toughening in ceria-stabilized zirconia. Journal of the European Ceramic Society 2005;25:3089-3096. Deville S, Gremillard L, Chevalier J, Fantozzi G. A critical comparison of methods for the determination of the aging sensitivity in biomedical grade yttria-stabilized zirconia. Journal of Biomedical Materials Research. Part B, Applied Biomaterials 2005;72:239-45. 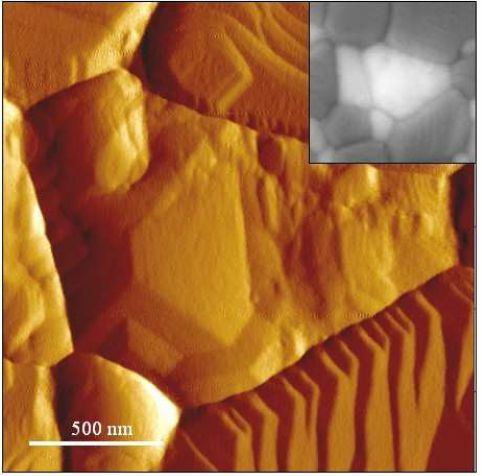 Deville S, Chevalier J, Gremillard L. Atomic force microscopy study of the tetragonal to monoclinic transformation behavior of silica doped yttria-stabilized zirconia. Journal of Materials Science 2005;40:3821-3823. Deville S, Chevalier J, El Attaoui H. Atomic force microscopy study and qualitative analysis of martensite relief in zirconia. Journal of the American Ceramic Society 2005;88:1261-1267. Gremillard L. Modeling the aging kinetics of zirconia ceramics. Journal of the European Ceramic Society 2004;24:3483-3489. Bartolomé JF, Montero I, Diaz M, López-Esteban S, Moya JS, Deville S, Gremillard L, Chevalier J, Fantozzi G. Accelerated aging in 3-mol%-yttria-stabilized tetragonal zirconia ceramics sintered in reducing conditions. Journal of the American Ceramic Society 2004;87:2282–2285. Deville S. Martensitic transformation in zirconia part i . nanometer scale prediction and measurement of transformation induced relief. Acta Materialia 2004;52:5697-5707. Chevalier J, Deville S, Münch E, Jullian R, Lair F. Critical effect of cubic phase on aging in 3mol% yttria-stabilized zirconia ceramics for hip replacement prosthesis. Biomaterials 2004;25:5539-45. Deville S. Martensitic transformation in zirconia part ii . martensite growth. Acta Materialia 2004;52:5709-5721. Deville S, Chevalier J. Martensitic relief observation by atomic force microscopy in yttria-stabilized zirconia. Journal of the American Ceramic Society 2003;86:2225–2227. Deville S. Low-temperature ageing of zirconia-toughened alumina ceramics and its implication in biomedical implants. Journal of the European Ceramic Society 2003;23:2975-2982. Pecharromán C, Bartolomé JF, Requena J, Moya JS, Deville S, Chevalier J, Fantozzi G, Torrecillas R. Percolative mechanism of aging in zirconia-containing ceramics for medical applications. Advanced Materials 2003;15:507-511. Deville S, Chevalier J, Dauvergne C, Fantozzi G, Bartolomé JF, Moya JS, Torrecillas R. Microstructural investigation of the aging behavior of (3y-tzp)-al2o3 composites. Journal of the American Ceramic Society 2005;88:1273-1280. Deville S, Chevalier J, Gremillard L. Influence of surface finish and residual stresses on the ageing sensitivity of biomedical grade zirconia. Biomaterials 2006;27:2186-92. Chevalier J, Gremillard L, Deville S. Low-temperature degradation of zirconia and implications for biomedical implants. Annual Review of Materials Research 2007;37:1-32.